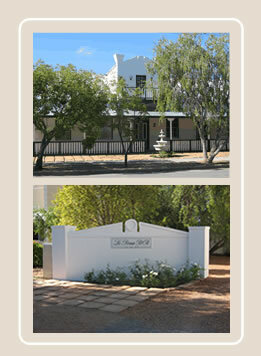 Le Roux B&B are situated in Ladismith, the Lady of the Klein Karoo. It is centrally situated on the increasingly popular Route 62 . But for many the appeal to the town lies in its combination of lovely architecture, friendly people and relaxed rural atmosphere. A German carpenter, F Heyman, who arrived in Ladismith with the Berlin missionaries, most probably built the house with its thick walls, yellowwood floors and high ceilings. At the back of this house were stables for the post cart's horses. The other buildings consists of rooms used by farmers and their families when visiting the town for communion services over weekends. Ladismith is unique in the sense that it has its own unique building style. The so called Ladismith style is a simplified Georgian design and dates from the 1830's.